In memory of our dear father. 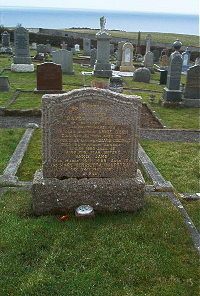 David Mackay died at Houstry Dunbeath 26th January 1935 aged 69. Wife Annie Gunn died 30th December 1950 aged 78. Son David George Mackay died at Saskatoon Canada 26th August 1950 aged 45. Daughter Annie Jane Mackay died 16th March 1989 aged 77. Daughter Mary Henrietta Mackay (Maretta) died 24th December 1989 aged 77.